The "real" monsoon cloud mass, though not very strong and intent, has now formed today, as seen in the satellite image of 00UTC Thursday. The mass of cloud is near the mid Arabian Sea, away from the cold waters formed by the Somali current, and now gradually nearing the Kerala coast in a south-westerly direction.My personal observations are that the monsoon has hit the Lanka coast today,29th., with moderately strong winds and rain. I see the monsoon hitting Kerala in 2 days, and then sliding north upto Karnataka coast in the next 2 days.The situation, in the northern region of the subcontinent, discussed in MW18, is gradually improving.The weak ridge in the Arabain Sea is still seen "faintly'', and the easterly jet streams at 200hpa are still yet to move north, being restricted by the westerly jets which are strong at 22N. 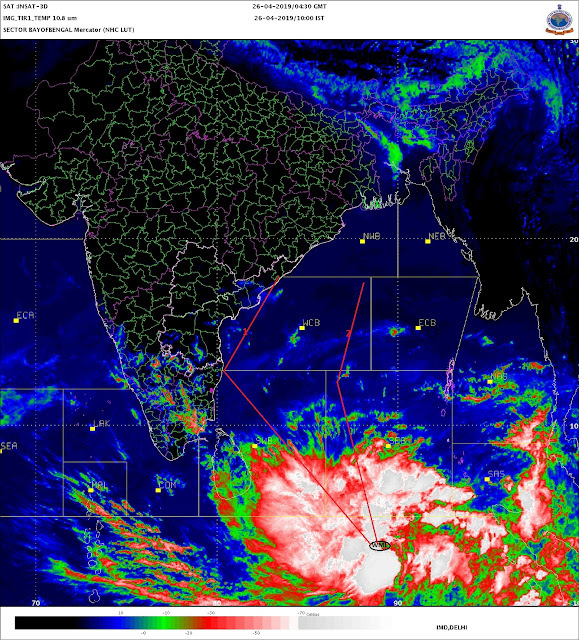 Concurrently, the further movement of the monsoon can be restricted by a few days. Monsoon should approach Mumbai by the 9th. Its strenght along the west coast may remain feeble upto the middle of June.The monsoon should advance into South Gujarat around 15th., and progress towards Saurashtra region in the next 3/4 days. In fact, with the seasonal low formation being delayed this year, June rains may be deficient in Gujarat, north-west region and Maharahtra. (maybe upto mid July,as discussed in MW17). Now, the ECMWF has, as of 0000 UTC Wednesday, given up on a major Arabian Sea cyclone. But, the 1200 UTC GFS forecast model has now shown an Arabian Sea cyclone that would end up landfalling upon Oman at the middle of next week. I do not know whether there will be an Arabian Sea tropical cyclone next week. The situation, I feel, seem to be favorable for a monsoon low or tropical depression westward from southern India (heading towards Kerala as the monsoon current). Hence, we can observe the numerical forecast model scenarios and make our judgements on the uncertainties of the the weather !